Over the past five years South Carolina has endured a series of natural disasters, including floods, hurricanes, tornadoes, and winter storms. Yet these natural disasters comprise a small percentage of the crisis events that businesses face every day, including fires, active shooter threats, sudden loss of key employees, supply chain disruptions, data breaches, technology outages, and many others. Increasingly, many interested parties such as insurance carriers and large companies that you may currently or in the near future serve as a customer, are asking industries about their ability to withstand business disruptions. They want to see and analyze your Business Continuity Plan to ensure that your business is able to continue critical operations through any crisis or disrupting event. 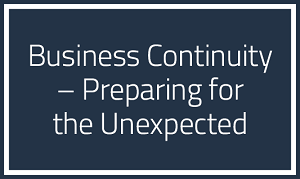 How well prepared is your business to withstand these events or to answer these questions? This workshop will cover the basics of Business Continuity Planning, from the initial Risk Assessment and Business Impact Analysis to the final plan development, implementation, training, exercises, and maintenance. Our facilitator and instructor is Scott Cave, Founder and Principal with Atlantic Business Continuity Services. Mr. Cave is a local consultant and Certified Business Continuity Professional who has over 15 years’ experience working with a wide variety of businesses and industries to develop and implement Business Continuity Plans. Join us for this interactive and educational workshop that will help you improve the overall readiness of your business to withstand the next disaster or crisis.